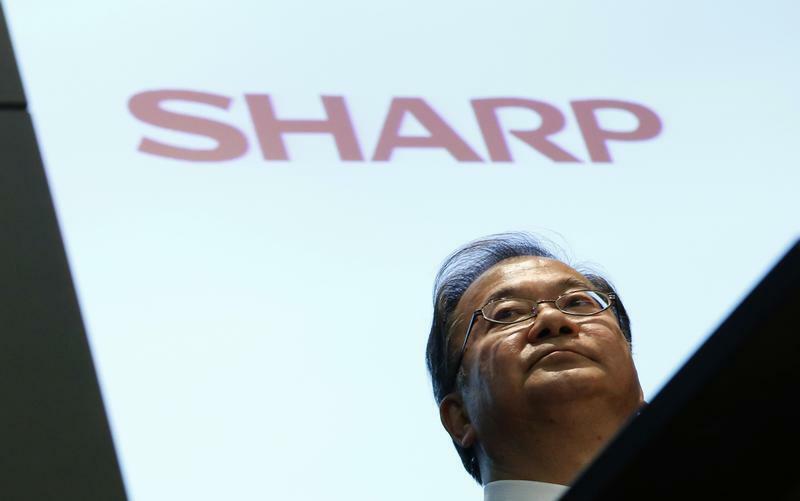 Foxconn would be better off without Sharp. The Taiwanese giant is trying to gatecrash a state-backed rescue of the ailing Japanese electronics firm with its own $5 billion-plus proposal. The target’s display technology would make Foxconn even more indispensable to Apple, for whom it builds iPhones and iPads. But fixing this basket case would be hard. And Sharp’s other businesses are a poor fit. Foxconn, formally known as Hon Hai Precision Industry, has grown huge assembling other people’s gadgets: its market value is about $33 billion. But profitability is tight: analysts foresee gross margins this year of just 7.2 percent. Making screens for phones and tablets – a business that Sharp dominates alongside Japan Display, LG and Samsung – would tilt Foxconn towards higher “value-added” businesses, and give it more clout in negotiations with customers. That helps explain why Foxconn boss Terry Gou has been keen on Sharp for years. Yet the $1.9 billion Japanese group is also a money pit which has racked up cumulative net losses of nearly 1 trillion yen ($8.5 billion), on sales of 13.7 trillion, in the five years to last March, Eikon data shows. It is now heading for its third bailout in four years. So Sharp requires radical action. As a foreign buyer, Guo might find it even harder to slash jobs and close factories as required. The limited overlap with Foxconnn would also make it harder to cut costs. That’s a disadvantage when compared with a plan put forward by state-backed Innovation Network Corporation of Japan, which would involve uniting Sharp’s liquid crystal display business with Japan Display. Then there’s the question of what Foxconn would do with Sharp’s other businesses, which include phones, appliances, copiers and TVs. An optimist would say these could help Foxconn accelerate away from being a pure contract manufacturer and towards selling more branded goods of its own. But this is hardly the group’s bread and butter – and so it’s not clear why Foxconn would do a better job than Sharp has. Foxconn’s interest may be academic anyway: Japan dreads technology leaking overseas, and an all-Japanese solution could be just days away. Though Guo might be disappointed, Foxconn’s other shareholders should be relieved. Sharp Corp's President Takeshi Okuda attends a news conference in Tokyo February 1, 2013. A Japanese state-backed fund and Sharp’s lenders are likely to agree on a new rescue plan worth around 650 billion yen ($5.5 billion) for the struggling display maker by next weekend, Reuters reported on Jan. 22, citing sources with direct knowledge of the matter. The plan would represent the third bailout in as many years for Sharp, which must also weigh a proposal from Apple supplier Foxconn. The state-backed fund, Innovation Network Corporation of Japan, is widely seen as the frontrunner to rescue Sharp as the government would like to keep its technology in Japanese hands. INCJ is offering to invest 300 billion yen in Sharp, while banks are expected to offer up to 350 billion yen in financing including 150 billion yen in a debt-for-equity swap, the sources told Reuters. Taiwan’s Foxconn, formally known as Hon Hai Precision Industry Co, has offered over 600 billion yen for Sharp but has not yet proposed any detailed restructuring plan for the company, the sources told Reuters, requesting anonymity because they were not authorised to talk to the media. INCJ is planning to later merge Sharp’s LCD business with rival Japan Display, in which it is the top shareholder, they added.